Jailing Brian Cavlan and Brian Sheridan, from Co Tyrone, and Dominic Dynes, from Co Monaghan, for seven years each at Belfast Crown Court, His Honour Judge Kinney told the trio he could see no reason to distinguish between their sentences. 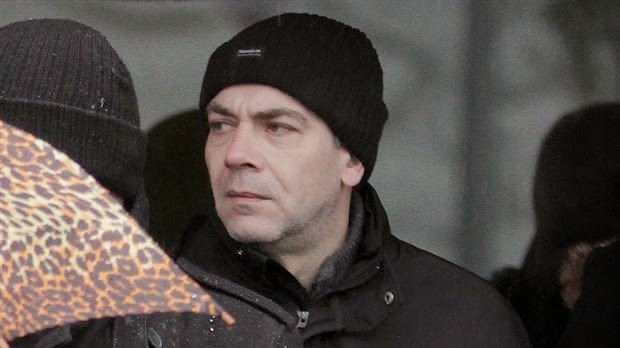 The judge had earlier heard how police had rammed the Citroen Xantia car being driven by Dominic Dynes, 41, on a country road outside Keady in Co Armagh on 22 April 2011 and when it was searched, officers uncovered a loaded .357 Magnum revolver in the front passenger footwell. In the boot, wrapped in pink material and covered in soil, they uncovered what the judge described as an "arsenal" of firearms which included an AK47 assault rifle, two other rifles, a handgun, magazines and bullets. Cavlan, who was sitting in the passenger seat, was noted by police to be wearing gardening gloves and his boots were covered in mud. During police interviews, the men claimed they had dug the guns up and were on their way to rebury them in an undisclosed location when they were caught. Dungannon Brian Cavlan, 37 and from the Circular Road, Brian Sheridan, 36 and from Blackwatertown and Dominic Dynes, from Bree, Castleblayney in Co Monaghan all pleaded guilty to having the loaded Magnum with intent to endanger life and possessing the other firearms under suspicious circumstances. Judge Kinney said given the circumstances of the find he accepted the men's claims and revealed there was no evidence to suggest the guns had been used in any terrorist operation before or how long they had been buried for. Similarly, said the judge, there was no evidence as to their intended use of the loaded gun given that despite having an opportunity to use it against the police, they had not in fact done so. He added however that all three "were fully aware of the nature of the weapons" which were "clearly linked to a terrorist organisation" although there were no charges of membership before the court "and they deny such membership." Jailing the trio and ordering they serve three years behind bars and four years on licence, Judge Kinney said his view was that "this was a one-off operation, not likely to be repeated" but that "only substantial custodial sentences can meet the requirements of the case."